I have been enjoying this pasta all summer. Every time Hubby says he wants pasta for dinner, I make this. I have a new obsession. I love the way all the fresh ingredients taste with the pasta, so good! It is so simple, here is how you make it: Cook pasta according to the box. When pasta is boiling chop tomato and fresh mozzarella cheese. Drain pasta. I use this and I don't drain all the water. Stir in pesto and tomatoes. 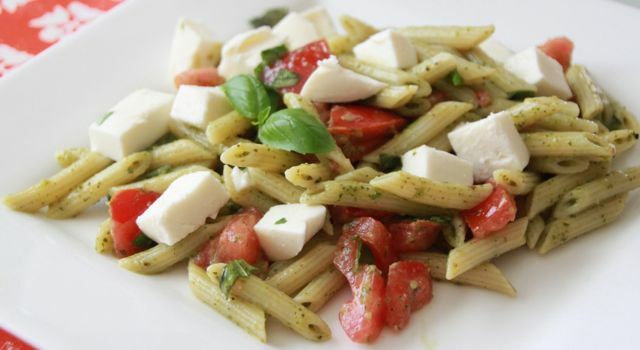 Plate and top with mozzarella and basil. Serve with crusty bread if you like. 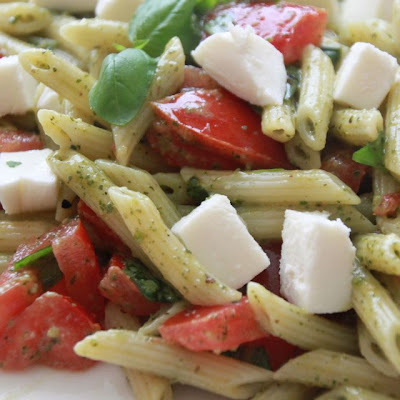 We use 1/2 box pasta, 1/2 c pesto, 1-2 tomatoes and a small ball of fresh mozzarella to make it for just the 3 of us. PB loves it! He asks for seconds and requests "green pasta" for dinner. I love that you can make as little or as much as you like, the recipe is very flexible. I love that I only get one pot, one knife, one strainer and one cutting board dirty so barely any dishes to do after dinner. I love the fresh tomato in there and I can't wait to eat my garden tomatoes like this. I love that I use store bought pesto making this a super easy meal. I love that I just have to wait for the water to boil and pasta to cook and stir it all together and dinner is done! It is the perfect busy summertime recipe. I start making this at 5:30 and we are eating by 6!! mmmm...that looks like the perfect summer salad!